Do I need CRM Training ? If you can use web-browser, Outlook, Word or Excel – then you already have the necessary computer skills to use Tall Emu CRM and you can do so with no training at all. Using the software is easy – the design is intuitive making navigation simple. For example – if you see a list of companies, and you want to look at the details – you just double click it. The same applies on every screen – the design is consistent. It’s easy – and there is online help available. However, you might need help on the best way to apply our CRM to your business, and this is where our training services are aimed. Initial Training and business process review. Assistance with the use of specific areas of the CRM like the quoting and selling areas, or links with Accounting systems. Help with how to map your existing business processes into CRM. We highly recommend one or more training sessions for your team. 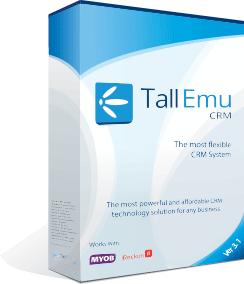 Tall Emu CRM is a large and powerful product so we also recommend that you don’t view training as a one off event. An initial training session will cover the basics of Tall Emu CRM operation, which is suitable for all CRM users. For users in specific roles, such as sales or marketing, we’d recommend further more tailored sessions in future. You can request training using our contact form below, or if you purchased the system through one of our partners you can also make the request directly with them. How do I receive the Training? Currently we offer both remote (web based) and on-site training. For small sites of one or two staff member, web-based training will be adequate. However, if you require more than one or two staff members to undertake training then in-person training deliver far superior results.